Jenny recently reported that one of her values seemed low and was going to repeat it. She obtained 0.9 M for 4-hydroxybenzaldehyde in THF (ONSC-EXP057). Compared against the previous value of 3.5M (UC-EXP208) it certainly seems like one of the values is off. To get a better idea of which it might be it can be useful to look at the solubility of structurally similar compounds. We can now do this using Rajarshi's web query tool by entering information in the SMARTS box. 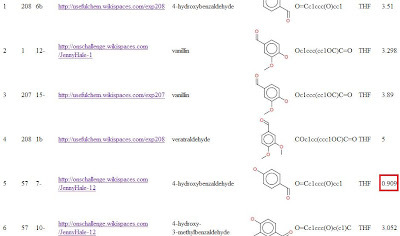 In this case we want to do a substructure search based on the skeleton of 4-hydroxybenzaldehyde. Putting the SMILES of that compound (O=Cc1ccc(O)cc1) in the SMARTS box and selecting THF returns 6 results. It certainly does seem that 0.9M is low for that group. More measurements will settle the issue.